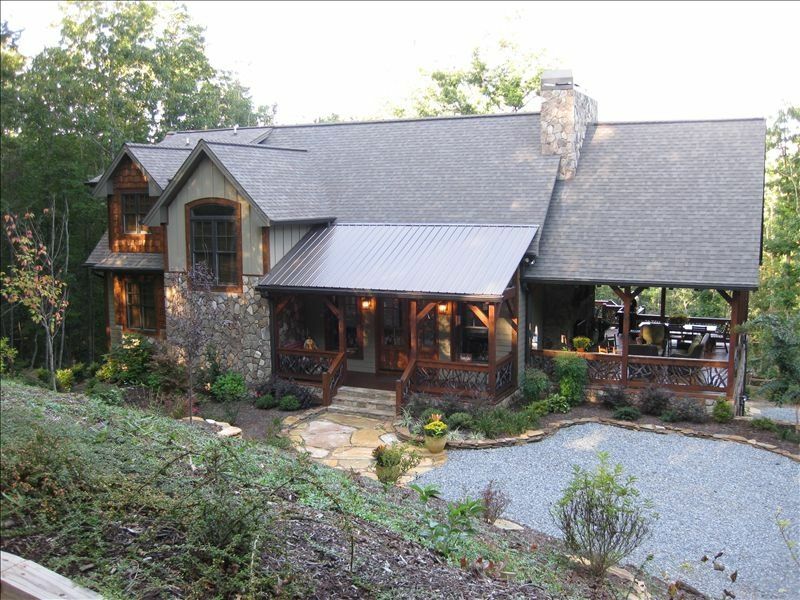 This elegant stone and wood mountain lodge is privately located amidst four acres of beautiful hardwoods and awaits to pamper you and your guests with a luxury vacation in the North Georgia Mountains. Amazing Grace is perfect for families and friends, reunions, honeymoons, and celebrations of all kinds. Our spacious (4,000 sq ft) mountain lodge was designed to exceed your expectations and is conveniently located to numerous mountain attractions. Whether roasting marshmallows around the fire pit, relaxing around the large dining table (sits 10-12) on the covered porch adjacent to a wood burning fireplace, tubing the Toccoa, hiking, relaxing in the Hot Springs Spa, or browsing in downtown Blue Ridge, you are sure to leave with an unforgettable experience. Our Family gathered on the large covered porch in front of the wood burning fireplace at Amazing Grace Lodge. We enjoy grilling out and eating on the spacious porch while taking in the views of mountains. Telling family stories around a warm fire in the fireplace or just roasting marshmallows with the kids or grand kids is also one of our favorites. You will certainly enjoy riding the Scenic Railroad along the Toccoa River, touring the Olympic White water center, whitewater rafting or kayaking the Ocoee or Nanahalia, tubing the Toccoa, shopping downtown Blue Ridge, art and music festivals, picking in the park, golf on numerous mountain courses, horseback riding, hiking the many trails of North Georgia, exploring in your 4 wheel drive jeep, touring mountain roads on your Harley or in your convertible, relaxing and reading a book, or just finding a comfortable rocker and enjoying the views, picking apples or other seasonal fruit, eating out, picnic by the river, sailing lake Blue Ridge or renting a pontoon boat for the day, spending a night at one of the eleven Drive-in movies left in the USA, checking out the hundreds of water falls in North Georgia, East Tennessee, and Western North Carolina. WOW what mountain views. Wake up in the morning, grab a cup of coffee and watch the views change by the minute. No two are the same. Cable TV so you won't need two remotes or have to worry about the weather as with Satellite TV. Our family of eleven had a wonderful time here; plenty of room for us all. The home was built with much attention to detail and art and is a destination by itself. The view in the back was spectacular with layers of mountains and beautiful sunrises. There was plenty of activity in and near Blue Ridge to please every age group. Lin was prompt and helpful in answering our questions. Thank you, Lin, for your hospitality. We want to come back. What a beautiful and spacious place. Well equipped with all the amenities of Home and more. Took my family of four, two friends for the children, and my parents...8 total. Enjoyed the outdoor fireplace each night and the Mountain View sunrise in the morning. The owner is very responsive to any needs you may have from booking to departure. The home is very convenient to downtown blue ridge (couple of miles), shopping, grocery store, stables, falls, etc. I also enjoyed watching and photographing the flock of wild turkeys that visited each morning. My family is already talking about return visits. Amazing Grace is an understatement, but as close as you can get to describing this wonderful home. Property was absolutely incredible! The cabin has everything a guest needs. The owner is very personable and easy to work with. The cabin feels very homey and comfortable. Very close to town. Easy access to everything to do in the Blue Ridge area and more. Gated community so we felt safe but still felt the mountain experience, Did a girls week trip there and loved every minute. Highly recommend this cabin. Wonderful family getaway!! We will definitely come again! This house is a wonderful place to rent in the Blue Ridge area. It is close to downtown and other amenities. It is a comfortable, peaceful, and quiet place to get away. The house has everything you need for an enjoyable stay. Much attention has been given to detail. Would definitely rent again. Amazing Grace Lodge far exceeded our expectations. The photos, while beautiful, don’t show just how amazing this home is. Our group of 6 adults and 5 kids stayed very comfortably. The kids loved the basement and bunk room, while the adults loved the kitchen, deck and the yard fire pit with amazing views. The home owner was very easy to work with and provided a lot of information about the area! Hucks General Store was a hit with the kids and the pizza at Blue Jean Pizza Co was delicious. This was our first trip to Blue Ridge and we will be back! Please call for other discounts and specials. $195-$500/night early booking specials for summer and Fall Winter and Spring rates are $325 for the first two nights, $250 for nights 3 to 7 Pay for six nights get seventh night free starting May 24 2019 Rates include up to 4 adults: $10 for each extra guest per night. Children under 12 stay free. $59 Damage Insurance is required. Call for other discounts and specials. *ALL CANCELLATIONS WILL BE SUBJECT TO A $50 ADMIN FEE!